"The raw adventure continues this morning with my satisfying Mango Monster Smoothie. Why is it a monster smoothie you ask? It's green, that's why...and green makes me think of monsters. This smoothie is so yummy and you can feel great drinking it because of how good it is for you!" 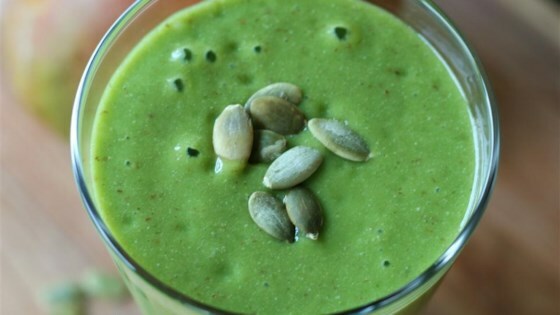 Blend flax seeds in a blender until finely ground; add pepitas and blend until ground, about 1 minute. Place mango, banana, water, ice cubes, and kale in the blender; blend until smooth, kale is fully incorporated, and the smoothie is uniform in color, about 3 minutes. Thin with more water to reach desired consistency. Freeze the banana the night before you want to make this smoothie. This was delicious! I added a bit of lime juice and used raw spinach as I didn't have any kale and it was fantastic! !